It seems that twitter new site, introduced some issue resulting in a worm exploiting a stored Xss. It search for "#!" in the Url and assign the content after that to the window.location object. And it is present in (almost?) every page on twitter.com main site. According to DOM Xss Wiki the location object is one of the first objects identified for being dangerous as it is both a source and a sink. After spotting the issue, I sent an email to twitter warning them about it but not without apologizing for finding it in the middle of worm spreading. The response was quite funny because, even if the issue was very straightforward, they cannot reproduce it because of safari antiXss filter. Obviously I checked on every browser but Safari ... and guess what ? Safari blocked it! We'll talk about it later. So I told them that it worked on Firefox, Chrome and Opera and after that they confirmed the issue, thanked me and so long. No more mails. Thanks Gaz for the title. Data Validation. 'c' is not validated as directed, that means every character but ":" is allowed. Data validation is about limiting the set of every possible input to an expected subset. Question is do we need to allow everything but one char? BlackListing. It is widely known that blacklisting could lead to bypasses if it is done loosely. No output encoding is applied. Since location assignment calls the URL Parser the context is quite known and have it's own metacharacters and structure. encoding in the URLParser context is also known as URLEncoding. string for the first occurrence of searchString. Let m be 0. The analysis tells that the fix is wrong, and in fact is possible to bypass the replace by doubling the colon ':' char. The replace just deletes the first occurrence of ':' so we just add two ':'. It has also the drawback to bypass several client side filters, Safari included. if it breaks things use a whitelist of allowed chars before going to assign a to the location. which at least let you stay on the same domain (not sure it works on every browser), but I don't know if it's ok for twitter. Also, please, send me an email when the fix is done, cause I don't want to set a cron job to get when the fix is deployed. Which resolves the multiple colons attack, but, IMHO, it is not really correct because of what I've said previously. 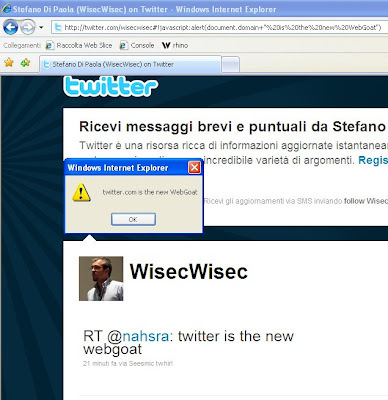 As a side consequence of the twitter DOM Xss I found myself playing with the Safari anti Xss filter. It seems that it tries to find a match between the payload used in the assignment to location and the values in the Url in browser location bar. After checking a bit in order to understand the behavior of the filter, I figured out that it urldecode the Url and then search for the pattern. The problem comes because of that. And there you have the bypass. Twitter finally set a working patch to the second wrong fix (see comments). Still not the best,IMHO, but at least it works...well, until there will be a bypass. Also, since the patch just blocks ':' still remains an arbitrary redirect issue. As it was to be expected, there is a bypass (already public) which works on IE8 (~26% market share). I found it yesterday independently by Gareth Heyes and Yusuke Hasegawa and reported to Twitter security team. The bypass takes advantage of the html entity version of ':' which is &#58; or &#x3a;. Internet Explorer 8, unlikely other browsers, when finds an entity converts it to its original value when it is assigned to the location object. will let the browser to go to ':' and not to literally "&x58;"
So, when the patch tries to replace ':' to an empty value, it won't find it, but the assignment to the location will convert it again to a colon. is still valid (not in blacklist). As I suggested in my first email. What happens here is that the assignment is performed on the correct attribute (the pathname) so that it is parsed in the right context with no possible bypasses to force a new URI scheme. Now everything *should* be really ok... well, if all browsers will behave in the right way! 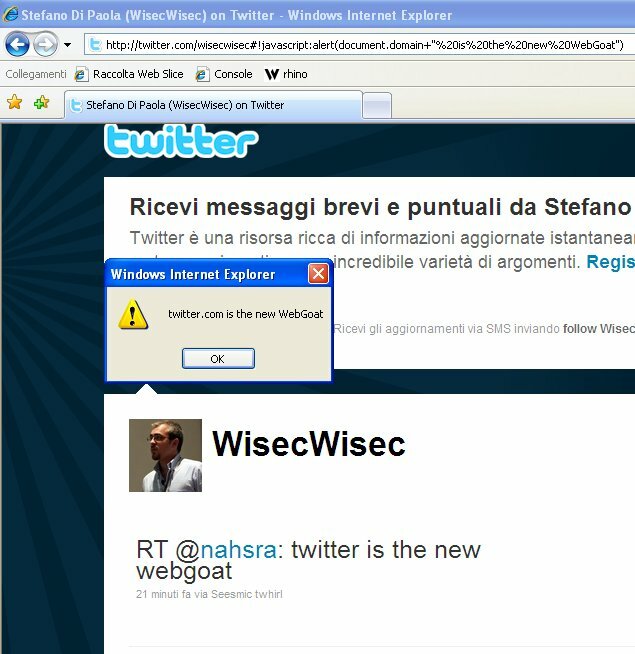 It seems twitter did not test the patch on every browser. IE doesn't recognize the third argument. For the readers, this attack is also stealth since everything that follows "#" is not sent to the server! Another update, I just wrote to them telling about the new issue since the last fix implemented by twitter seems to work _only_ on Firefox. As the default, all of their testers should have browsers with XSS filters and pop-up blockers turned off. Even if its not on their main browsers they should have access to browsers with those settings via their VM's. I also raised an XSS issue in IE but it only ran with the XSS filter turned off (and at first they also couldn't reproduce it). I thought it may have been due to the fact the users had to be logged out (the XSS was on the login form) however I'm now thinking it was due to their browsers having all of the filters turned on. That could be a good explaination of what happened. It still means that some process needs to be improved. no you did not miss anything...it's known. as we already said in the comments. They failed fixing it. The fix works only on Firefox. I haven't seen anything like that in the newtwitter interface, have you had a look at it? I cant understand what you mean. The story, finally seems to have come to a good ending..
Patched using a correct context aware assignment! And this time no open redirects as well!